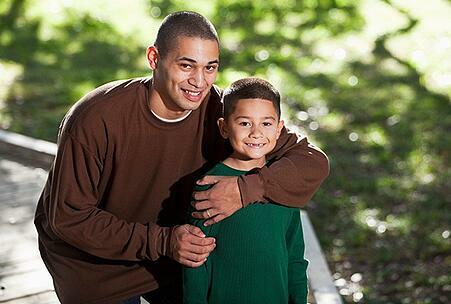 The foundation of any effective effort to serve dads is a father-friendly organization. To lay the rebar for that foundation, it’s essential to create a father-friendly environment that says to dads, “You’re welcome and wanted here!” It’s also essential to integrate that environment with dad-specific programs and services. Inspire Development Centers (Inspire) headquartered in Sunnyside, WA is one of the best examples of how to create a father-friendly environment—and how to integrate it with a fatherhood program—that I’ve seen in my nearly two decades with National Fatherhood Initiative®(NFI). To learn more about this environment, I recently interviewed Marisol Izazaga and Frances Cuevas, two of Inspire’s Family and Community Partnership Specialists who work with dads. Inspire serves a primarily Hispanic clientele, many of whom are Spanish-dominant or Spanish-only speakers. Many of those Spanish speakers are seasonal migrants. Inspire’s primary programs are Head Start and Early Head Start. Inspire has a large footprint. They offer the programs in more than 26 centers that serve multiple counties across Washington. They also use the evidence-based Early Head Start-Home Visiting model to conduct home visits. The inspiration for starting an initiative to better reach and serve dads arose from staff’s frustration with the lack of dads’ attendance at parent meetings and other parenting events. Staff agreed that they needed to create an initiative specifically for dads to draw them out and that communicated to dads that their involvement in their children’s education, and lives in general, was important. They recognized that the first step was to ensure that staff at all levels would engage in the initiative. In 2016 they started their initiative with staff training on the importance of engaging dads and other significant males in children’s lives. They launched this training at an annual conference for staff that takes place at the start of every school year. Select staff also received training on a fatherhood program that they started to offer in 2017. As they launched their initiative, they conducted research on dad-specific resources and found them in short supply. That’s when they learned about NFI from another organization partner in Washington that uses our print materials and runs the 24/7 Dad® program. After they reviewed materials on our website, they were pleased to find that both the Spanish- and English-language materials were easy to read and understand, a must for the parents Inspire serves. Some of the parents, Marisol and Frances explained, can’t read or write at all, or can only do so at a low level of literacy. Staff appreciate that they or the parents’ children can easily read to and share the materials with parents, especially the tip cards. They also like that the images, especially in the posters, send the message about the importance of dads, so that as staff or children read the materials to parents that the parents can look at the supporting images. Inspire acquired a range of NFI’s tip cards, brochures, and posters in Spanish and English for use across their centers. They acquired most of the Spanish-language materials by purchasing the Spanish Resource Bundle, a collection of our most popular Spanish-language resources for dads and moms. Marisol and Frances shared that in Hispanic cultures dads’ importance centers around their role as the financial provider. As a result, they’re often not engaged in their children’s education and discipline. Dads tend to get involved more broadly when their children enter their teens. Dads see the care of young children as a mom’s role. Even moms, they say, see dads becoming involved more broadly only with older children. The primary value of the print materials is that they help staff ensure that dads learn they are vital to their children’s education, and life in general, starting in their children’s early years. They also help staff ensure that moms know about importance of dads’ early involvement. Displays posters in the entrance to create a welcoming environment. The larger centers also display posters in hallways. Places tip cards and brochures near the entrance in a rack on the floor or counter located in or near a waiting area. Displays posters in break and conference rooms to send and reinforce the message to staff about dads’ importance. Even though Inspire now reaches dads more effectively, it’s still primarily moms that staff reach. (Some of the dads who are migrant workers often work until 7:00 or 8:00 PM, so it’s very hard to engage them.) Inspire has found novel ways to distribute NFI print materials to moms to give to dads. On one recent evening, for example, staff held a family literacy night. Parents brought their children to their center’s playground for interactive parent-child activities that focused on increasing literacy. This night included a presentation on the importance of dad (and significant male) engagement. The moms who attended asked for a lot of tips on how to engage dads, and NFI’s resources came in handy. Staff provided the resources for moms to take home to the dads. Last, but certainly not least, staff distribute print materials to dads who attend sessions of their fatherhood program. While that kind of integration of print materials is common among NFI’s organization partners that run fatherhood programs, the following integration of print materials isn’t. In addition to acquiring the Spanish-language posters in the bundle, they acquired English-language posters that included NFI’s Father Facts posters. Facilitators of the fatherhood program carry these posters with them as they travel from center to center to facilitate different dad groups. They use the images and statistics in the posters during the first session of the program to start a discussion on the importance of dads. Some facilitators also use the posters in subsequent sessions. I hope this partner spotlight has inspired you to think of ways you can use NFI’s print materials to create a father-friendly environment and ways in which you can integrate them with your fatherhood program. How well does your organization use print materials to create a father-friendly environment? Did you know about all of the Spanish-language materials available from NFI?